Apple fans, your wait to buy the new MacBook Air is over. Apple last month unveiled the updated version of its best-selling laptop, along with the new iPad Pros and the upgraded Mac mini, at its event in Brooklyn. And this week, the new Apple MacBook Air quietly went on sale in India. The new MacBook Air comes in two variants in India. One has 8GB of RAM and 128GB of internal storage and the other has 16GB of RAM and 256GB of onboard storage. While the base model is priced at Rs 1,14,900, the high-end version costs Rs 1,34,900. Both the models of MacBook Air are available in Gold, Silver, and Space Grey colour variants. You can head to official Apple stores like iWorld and Unicorn to get one for yourself. We confirmed with iWorld as well as Unicorn store and both said that MacBook Air 2018 is available with them for sale. A complete list of stores where it is available can be found here. Coming to the specifications of the new MacBook Air, it features a 13.3-inch Retina display with a resolution of 2560×1600 and has 50% narrower bezels than its predecessor. The company has claimed that the display shows 48% more colours. Like we mentioned earlier, the Apple MacBook Air 2018 comes with a Touch ID that works with the T2 chip. This ensures that the system’s software doesn’t get compromised and isn’t tampered with. The laptop comes with Apple’s digital assistant Siri and does data encryption for SSD. Apple MacBook Air 2018 is powered by an 8th generation dual-core Intel Core i5 processor and its battery life is said to last for 12 hours with web browsing and 13 hours when movies are being played off iTunes. 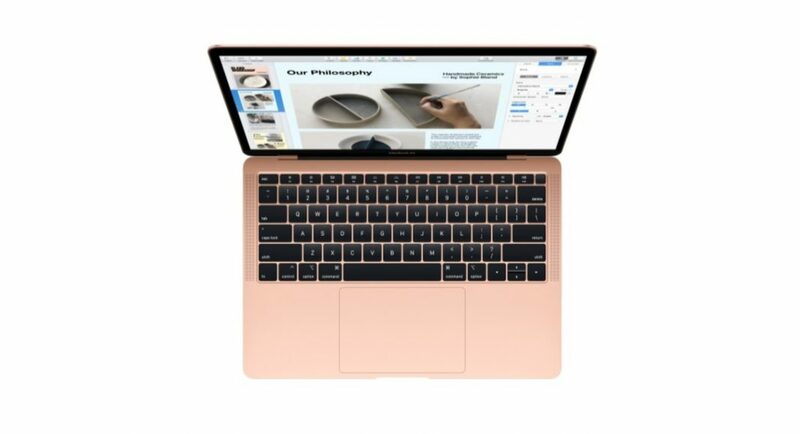 The device comes with a 4th generation butterfly type keyboard and Apple says that it is more responsive and precise than it ever was. All the keys of the new MacBook Air’s keyboard are individually backlit and it comes with a Force Touch trackpad which has 20% more area. The new MacBook Air’s speaker is claimed to come with twice as bass as the previous laptop in the series.